Innovation Leaders in Digital Projection ProjectorTeam has over 15 years of experience in the A/V industry. We provide our expertise and assist you in finding the perfect Projector, Screen and Accessories to enhance your Visual and Audio experience. Please complete the form below, and we'll call you to discuss your exact project requirements. ProjectorTeam specializes in assisting you in your search for the correct projector and accessories. 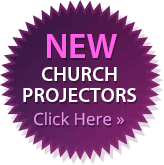 Whether it is the Hitachi short throws, or the Hitachi Church Projector, you won't find a better price. We are a direct dealer for Hitachi, Ricoh, Eiki, Sony, NEC, and BenQ. If it is a screen you need DaLite Screen Company and Mustang screens are the ticket. Whether you are looking for your church, classroom, corporate setting, classroom or personal application, ProjectorTeam will develop a program that will get you the best price without compromising quality. Your success is our main goal. ProjectorTeam also offers full installation of your equipment at a very competitive price. As a direct authorized dealer, we make sure you are in tune with everything the manufacturer has to offer. We want to make sure every purchase you make meets with your standard of excellence. Give us your first and last look and we promise you won't be sorry. ProjectorTeam offers integration capability. If your business is looking for installation of the project let us know and we can work with you to make that happen. As a Direct Authorized Dealer we make sure you are in tune with everything the manufacturer has to offer and will assist you if there is ever anything wrong with either the quality of the product or performance of the product. We want to make sure that every purchase you make through our company meets with your standard of excellence.